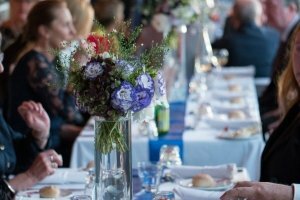 Over the years Harbour Kitchen has built a fantastic reputation as Melbourne’s best function venue for engagements and wedding parties. These events are certainly two specialties of ours, but there are many more strings to the Harbour Kitchen function bow. One of these is the post marriage celebration that can and should be celebrated every year. We are talking, of course, about your anniversary! Often couples have wild engagement parties and all-in weddings, but neglect to celebrate their marriage properly from then on (takeaways and a bottle of wine don’t count). A union between two people is worth celebrating often and, of course, an anniversary gives you a once in a year opportunity to reinforce your love for the special person in your life. At Harbour Kitchen, we use our years of event expertise to ensure that your function venue is as perfect as your significant other. For the most enduring marriages there are anniversaries that take on extra significance. A silver jubilee represents a marriage of 25 years, a ruby jubilee 40, a golden jubilee 50, a ruby jubilee 60 and the platinum jubilee which, at 75 years, is the matrimonial equivalent of an ultra-marathon. These occasions are as rare as the precious metals and stones themselves and represent an incredible achievement. We love seeing the beaming faces of happy couples who have, and are still, going the distance. It may be that you celebrated your engagement or wedding at Harbour Kitchen function venue and want to relive and replicate the occasion as closely as possible, or perhaps you’ve been a little remiss for a few years when it comes to your anniversary and want to make up for it. Whether you have a big celebration every year or have a jubilee coming up, we’re here for you. Harbour Kitchen is dedicated to making your special date on the calendar the most memorable day of the year for you and your guests.